Jalandhar : State president of the Bhartiya Janata Party Sh. Kamal Sharma has said that drugs menace in Punjab is more serious than terrorism and has to be dealt at that level only. Sh. Sharma stated this while addressing hundreds of youth, who participated in the marathon organised by the Bhartiya Janata Yuva Morcha (BJYM) to mark the International Day Against Drug Abuse. He vowed the youth to play an active role in the crusade against drugs and other social evils. Speaking at Swami Vivekanand Chowk, the starting point of the marathon, BJP President Sh. Sharma said that if an individual indulges in drug addiction, it has far reaching consequences not only for the addict but his entire family. He also said that it was true that drug abuse is a social evil but now it has acquired alarming proportions and figures in the category of terrorism. Sh. Sharma said that battle against the drug menace has to be undertaken not only at government level but also at social, political and family level as well. Sh. Sharma said that BJYM has taken a big initiative in this regard by organising the marathon in different parts of the state. He further said that BJP was already doing its best against the drug menace at all the levels and would continue to do so in future as well. He also appreciated the Yuva Morcha for its initiative and exhorted them to take the baton of anti-drug campaign to each and every house ofPunjab. Addressing the youth, Sh. Ashu Sampla, state secretary of BJYM and incharge of the today’s programme said that youth can change the fortune of any country. He said that the youth of Punjab has woken up against the drug menace and soon Punjab would be free from this ugly menace of drugs. The marathon started from Swami Vivekanand Chowk and passed through Patel Chowk, Purani Sabzi Mandi and Kapurthala Chowk before finally culminating at Swami Vivekanand Chowk. BJP state president Sh. 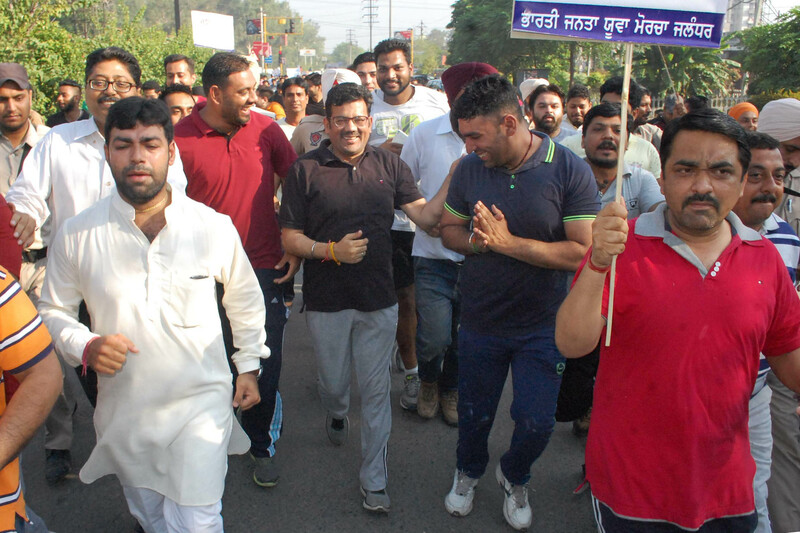 Kamal Sharma himself ran with the youth in order to encourage them. Those present in the programme were Sh. Subhash Sood, BJP Jalandhar president, Sh. Amarjeet Singh Amri, BJP Transport Cell president,Sh.Kishan Lal Sharma President BJP Cultural cell, Sh. Rajeev Dhingra, president of the district unit of Yuva Morcha, Sh. Ashok Sareen, Sh. Pankaj Julka, Sh. Harjinder Warring, Sh. Raman Pubby, Sh. Subhash Bhagat, Sh. Ram Lubhaya Kapoor and S. Kirpal Singh.